DIEGO COSTA has spoken of his delight at being able to return "home" to Atletico Madrid but admits he’s scared of the club’s training sessions. Chelsea announced on Thursday that they had agreed to sell the 28-year-old striker back to Atletico, with the fee reported to be in the region of £58million. 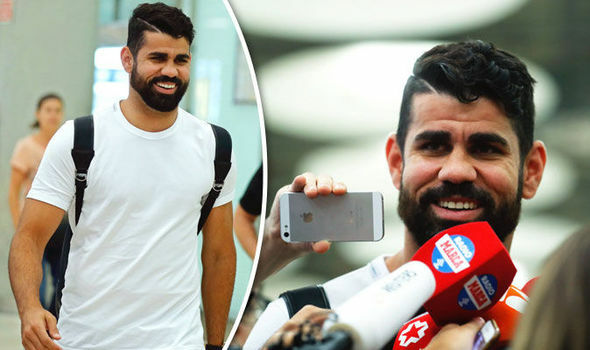 Costa is unable to play for Atletico until January due to their transfer ban, but he is nevertheless thrilled to have been granted his wish to re-join the club. "I'm very happy. It's taken a lot of time but it has a happy ending,” Costa told reporters at Barajas airport, according to Marca. “Now I'm waiting to see my team-mates and train. I'm looking forward to giving my best as always, and hopefully things go well. "It always makes you a little nervous when time is passing by, but (Atletico chief executive) Miguel Angel Gil has made a great effort and I'm grateful to him, like everybody at the club. “I’m very happy and will try to show my thanks in some way." Costa, who had two years left on his contract with the Premier League champions, also commented on his acrimonious Stamford Bridge exit. "It's not the way I wanted it leave, ever,” he said. “I have special affection for the people at Chelsea. I'm not a person who is going to smear the image. They know the person I am. "I wanted to return (to Atletico). I'm not going to be ungrateful to Chelsea, where I was also very happy, playing in a team that was great. Atletico is my home and I'm here." Having not taken part in pre-season training with Chelsea, Costa's is unlikely to be at peak fitness. "I'm not as bad as some say and here we have El Profe Ortega (Atletico's fitness coach Oscar Ortega) who is going to have me in shape,” the Spain international continued. “The scales don't scare me, his training sessions scare me!"